Cynicism and hope, earth and sky. Last week I wrote on Twitter that even when I’m escaping, I feel like I am plotting my escape. 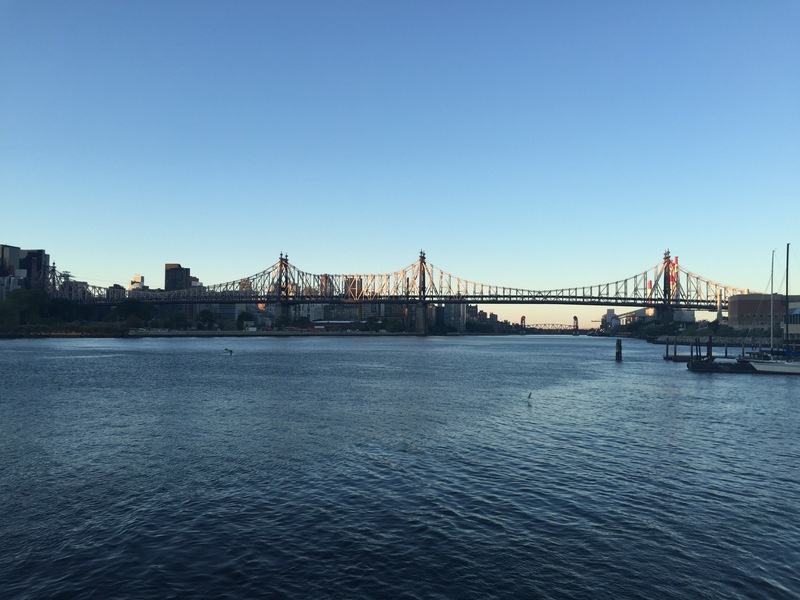 This evening I went running along the East River during sunset. While following the glittering skyline, I was thinking about writing and had a country music playlist playing on repeat. I felt distracted by all the lyrics about love lost, so I started listening instead to On Being’s interview with Maria Popova, Cartographer of Meaning in a Digital Age. I think a lot about this relationship between cynicism and hope. And critical thinking without hope is cynicism. But hope without critical thinking is naïveté. And I try to live in this place between the two to try to build a life there because finding fault and feeling hopeless about improving our situation produces resignation of which cynicism is a symptom and against which it is the sort of futile self-protection mechanism. But on the other hand, believing blindly that everything will work out just fine also produces a kind of resignation because we have no motive to apply ourselves toward making things better. And I think in order to survive, both as individuals and as a civilization, but especially in order to thrive, we need to bridge critical thinking with hope. I struggle with the feeling of both types of resignation that Maria mentions. This morning at about 5AM while in bed and looking out the window in a different city, I watched the sun leisurely begin to appear. I experienced the rare luxury of falling back asleep and dreamed a hundred dreams before fluttering my eyes open to the height of the sunrise. Maybe it all happened in a matter of minutes, but I felt this “uninterrupted intimacy” of that space in time. Despite the earlier pervasiveness of various worries that tend to inundate my mind, I tried hard to consciously make room and invite in the contentment and magic of the room bathed in white and orange light. [The best of ideas] came to me at the gym or on my bike or in the shower. And I used to have these elaborate theories that maybe there was something about the movement of the body and the water that magically sparked a deeper consciousness. But I’ve really come to realize the kind of obvious thing which is that these are simply the most unburdened spaces in my life, the moments in which I have the greatest uninterrupted intimacy with my own mind, with my own experience. And there’s nothing magical, at least not in the mystical sense, about that. It’s just a kind of ordinary magic that’s available to each of us just by default if only we made that deliberate choice to make room for it and to invite it in. Towards the end of my run, I watched a bird in flight skim the air just above the water. I smiled. The graceful and joyous occupancy of the space and time between earth and sky. We never see the world exactly as it is because we are how the world is. Was it — I think it was William James who said, “My experience is what I agree to attend to, and only those things which I notice shaped my mind.” And so in choosing how we are in the world, we shape our experience of that world, our contribution to it. We shape our world, our inner world, our outer world, which is really the only one we’ll ever know. Well, once again, I am going to side with Thoreau. And he said something like, if the day and night are such that you greet them with joy, and life emits a fragrance like flowers, it’s more elastic and more starry and more immortal, that is your success. And for me, that’s pretty much it — waking up and being excited and curiously restless to face the day ahead, and being very present with that day, and then going to bed feeling like it actually happened, that the day was lived. I mean, there’s nothing more than that, really. Maria Popova is the one-woman show behind Brain Pickings. Play the episode of On Being here. Much I could share with you about this weekend as I sit here with my beach-tousled wet hair. To be honest, though, mostly I felt arrested with uncertainty for a good part of it (nothing new here), and this morning I went running to clear my head. I’ve been trying to listen to Podcasts to exercise my listening attention span. Little-known fact, I’m actually a terrible listener. Rather, my listening comprehension skills can be inhibited because I get distracted easily. I have to work really hard at listening. This is why I always write notes verbatim, to hide this fact and make up for this weakness. As luck would have it, a few months ago I had downloaded On Being’s interview with Pico Iyer, entitled The Art of Stillness. (Here is the transcript if, like me, you are a stronger reader than listener.) Serendipitously, I just started reading a book about traveling that references a quote of his in the first few pages. It’s funny, when we go to an airport, nowadays, there are so many recharging stations for devices and very few for our soul. Krista Tippett mentions Iyer’s insistence that we are rediscovering the “urgency of slowing down.” Iyer responds, “Well, I think we’re all feeling dizzy.” I struggle to remember that I choose where my attention goes, and I choose what I feel I’m “competing” with. And so I sometimes think that travel is how I get my excitement and stimulation, but stillness is how I keep myself sane. You know, Pascal, wonderfully, in the 17th century said our problem is distraction, but we try to distract ourselves from distractions. So we get even worse in this vicious cycle. So the only cure for distraction is attention. And I go to my monastery, and I go to Japan because they are cathedrals of attention. And they’re places where people are very attentive and where people like me can try to learn attention. This relates to Mary Oliver’s discovery that “attention without feeling is just a report.” More and more, I try to slow down and examine my feelings of urgency or comparison or envy or hopelessness by becoming more aware of my immediate world, and being more grounded by practicing attention towards my inner being. Only then can I face outward and find the people to whom and activities/thoughts to which I should gift my attention. But I mean, I was reading recently that there’s some new study of that as people — when we’re young, we’re kind of hardwired to find excitement and to find satisfaction in novelty. And that as we age, we more naturally find excitement and satisfaction in what is ordinary, in patterns and habits and kind of the everyday contours of our lives. As Iyer says, “not everyone leans into stillness” even with the passage into older age. I can see some of my friends forever being caught up in the frenzy of novelty. But I do believe that we have the ability to choose our ride rather than let ourselves feel carried away by currents we never decided to follow and rollercoasters we never hoped to get on. I can choose how to react, and I can choose the degree of vulnerability that I feel. It takes practice, it takes time. At first glance, the inside world can seem less appealing than the shiny, sparkly enticement of the outer world. I ask myself what my definition of luxury is. I try not to allow others’ expectations or desires dictate what my luxury looks like. I stop and ask myself whether the outer world that seems so terrifyingly impactful at the moment really reflects on the landscape I’m interested in at all. And at some point, I thought, well, I’ve been really lucky to see many, many places. Now, the great adventure is the inner world that I’ve spent a lot of time gathering emotions, impressions, and experiences. Now, I just want to sit still for years on end, really, charting that inner landscape because I think anybody who travels knows that you’re not really doing so in order to move around — you’re traveling in order to be moved. And really what you’re seeing is not just the Grand Canyon or the Great Wall but some moods or intimations or places inside yourself that you never ordinarily see when you’re sleepwalking through your daily life.